Did you see recently that Moley Robotics and BBC Masterchef winner 2011 Tim Anderson have trained a robot to cook thousands of dishes? 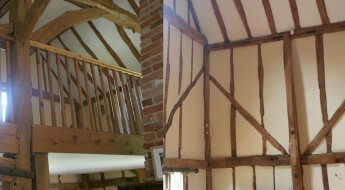 While I’d quite like an extra pair of hands in the kitchen sometimes (clearing up after breakfast with two little ones, yes please!) I think it will be a while before we’ll see robots cooking dinner at The Barn. But in the meantime, a helping hand from quality kitchen accessories is very welcome – frankly I need all the help I can get! 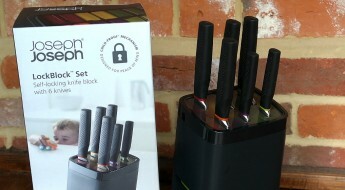 The fashionable yet functional kitchenware from Richard and Anthony Joseph, the brothers behind the innovative Joseph Joseph range, are brightly coloured and a very smart edition to any kitchen and when they asked if we’d like to try out a few of their products I was keen to see how they performed. Could they improve on our well-honed Sunday lunch preparations? I say ‘we’ because Sunday lunch is the one meal of the week when the husband takes charge. I’m relegated to sous chef status, prepping vegetables and warming dishes while he meticulously prepares the meat and works out all the timings. It’s practically a military operation! A couple of Sundays ago my Mother was staying with us and our six year old asked if she could help Nana peel the vegetables for our meal. While I would have been a bit reticent Nana immediately said ‘Yes!’ and involved her in the process straight away – don’t you just love that about grandparents? 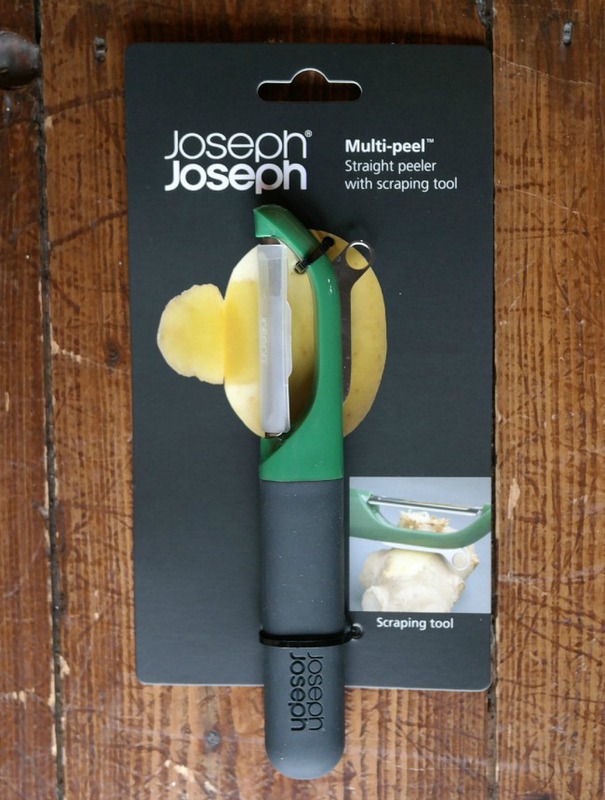 We had a huge pile of root vegetables to prepare so it was a great opportunity to put the three Joseph Joseph Multi-peel peelers through their paces. 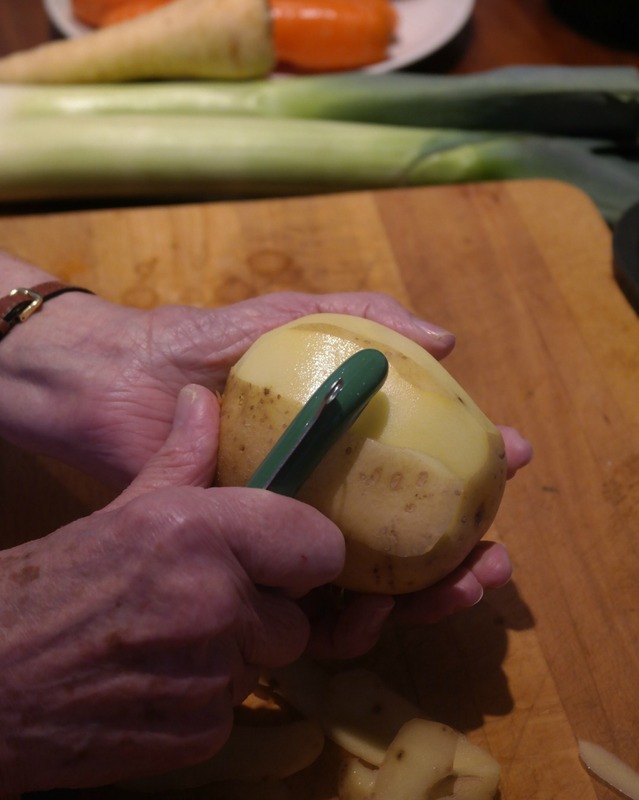 Up first was the Multi-peel straight peeler with two additional tools – a scraper and an eye remover – perfect for potatoes. 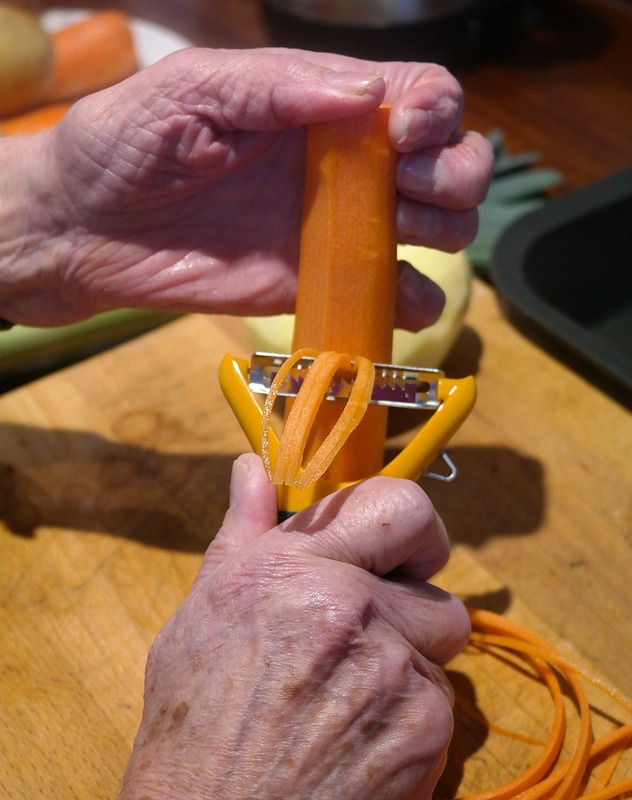 My Mother set to work showing our eldest how to peel like pro and she commented straight away how the incredibly sharp blade made peeling super easy. 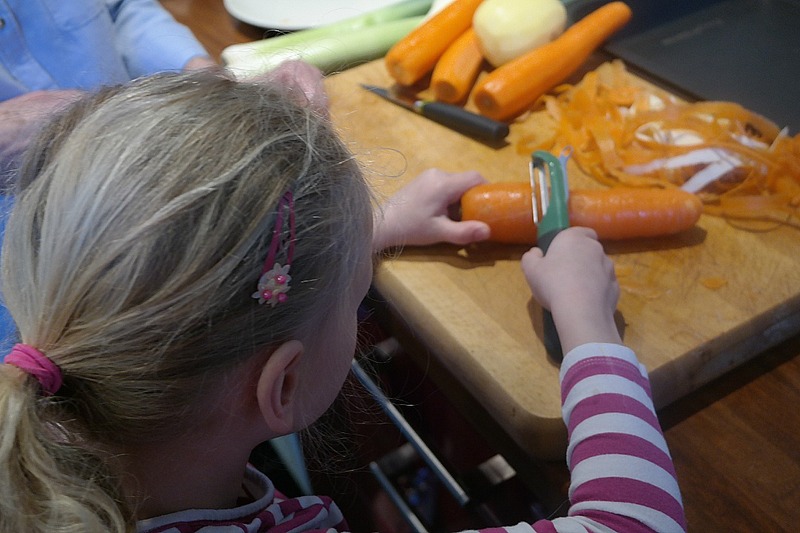 Onto the carrots and this time our daughter had a go – I was so proud standing back and watching her in the kitchen next to her Grandmother. Three generations preparing Sunday lunch – such a special moment. 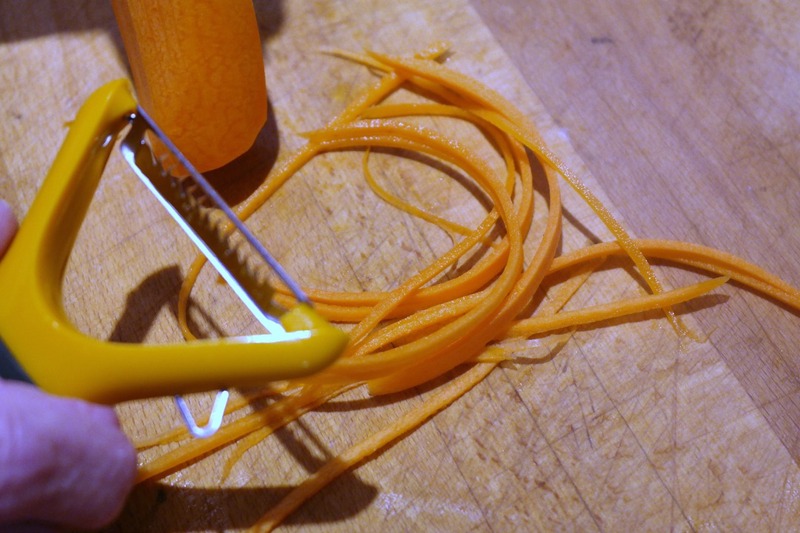 While the carrots were on the chopping board we decided to try out the Julienne Peeler – not strictly needed for Sunday lunch but great for garnishes. And the results were fab – perfect for creating a delicious carrot salad with a lemon juice, olive oil and wholegrain mustard dressing. 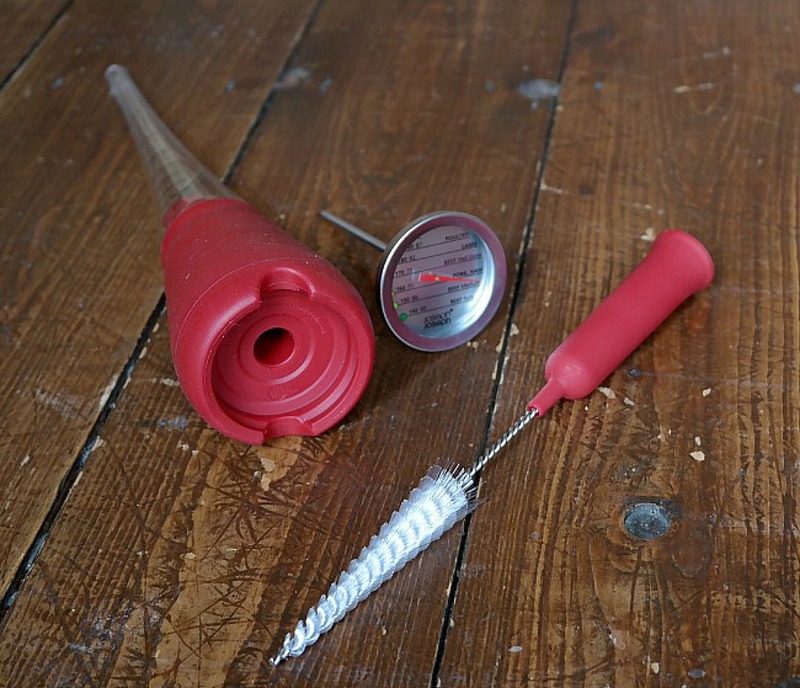 I can see myself using this a lot in the Summer for salads, garnishes, even toppings for burgers fresh from the BBQ in our garden. 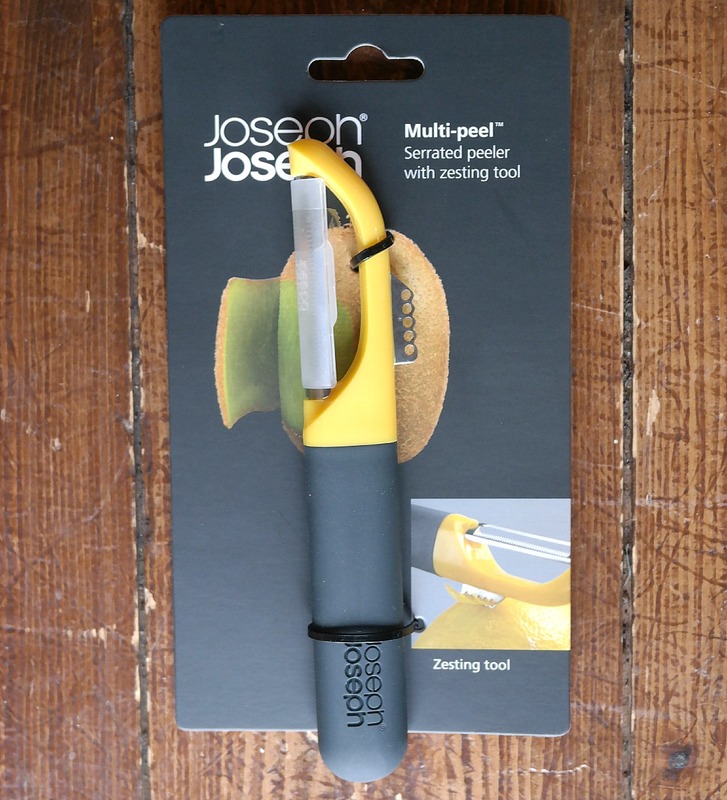 The last peeler in the Multi-peel set has a serrated edge perfect for soft-skinned fruit and vegetables. 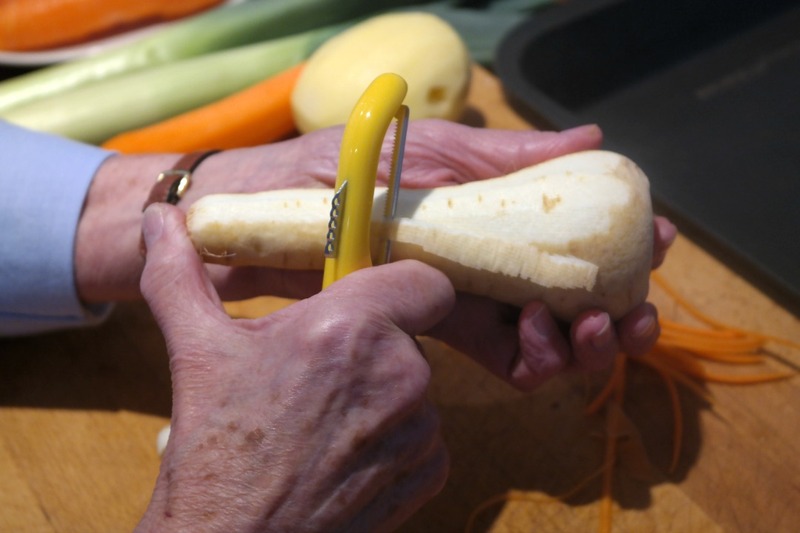 Our slightly-past-their-best parsnips were not strictly soft-skinned but the peeler did a great job nevertheless and I’ve used it since on pears – the little people’s favourite fruit – to great effect. It would be perfect for kiwis too, I always find them so tricky to peel without losing all the flesh with the furry peel. With the vegetables prepped and ready for roasting with olive oil, herbs, dried apricots for sweetness and a sprinkling of panko breadcrumbs for some extra crunch, we could move on to the meat – roast chicken, a big family favourite. 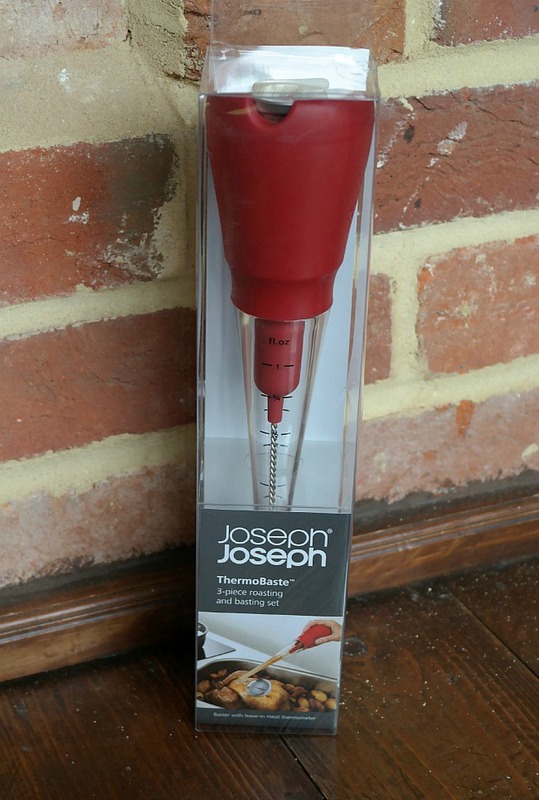 There’s nothing worse than dry roast meat, and while the husband is the meat maestro he was keen to try out the Joseph Joseph ThermoBaste as it has an integrated baster, meat thermometer and even a cleaning brush. 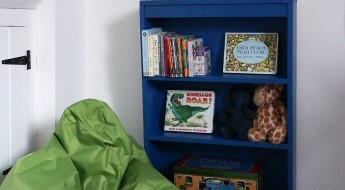 All three pieces fit together for easy storage. 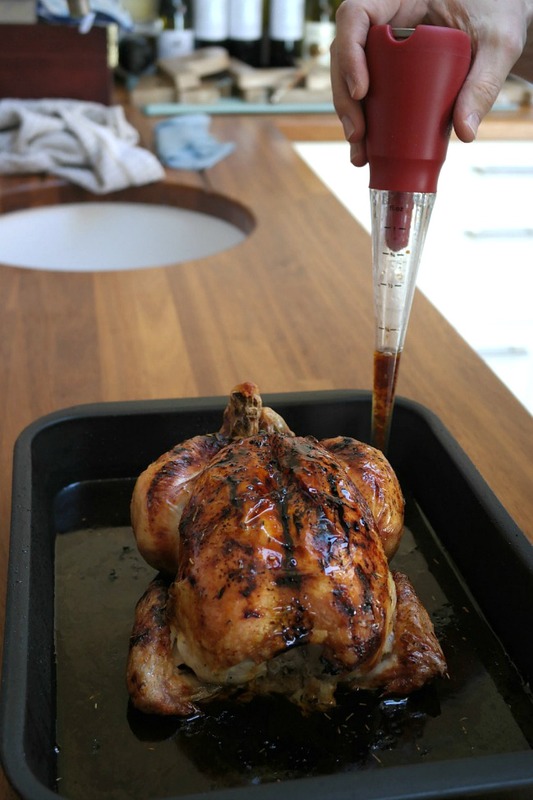 After a bit of fiddling we managed to get all three pieces apart and the baster did a good job of basting the chicken. 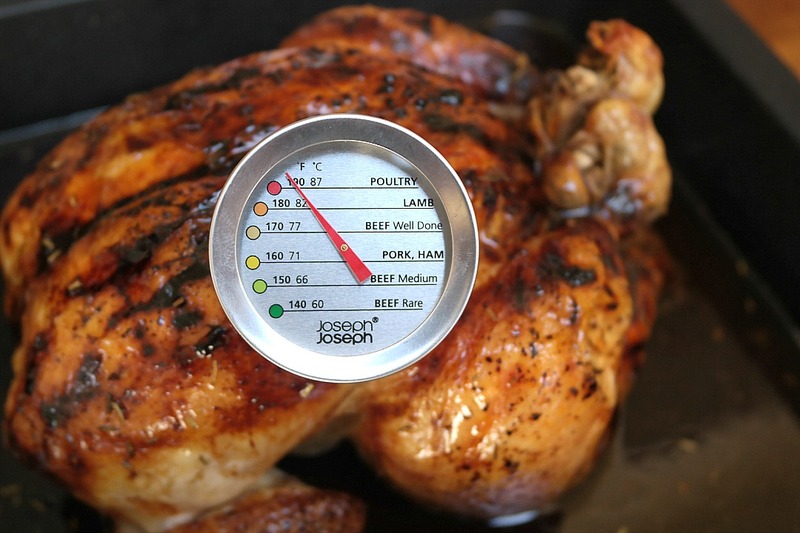 The thermometer can be left in the oven so you can check when the meat is done without opening the oven door and letting out all the heat – a great improvement on our current one – and the dial is super clear so you know precisely when each time of meat is perfectly cooked. We were very impressed with the Joseph Joseph range and they’ve already become a staple part of our Sunday lunch preparations. The super sharp blades, sturdy construction and bright colours work perfectly with our kitchen and all three parts of the ThermoBaste washed well and fitted back with some practice. 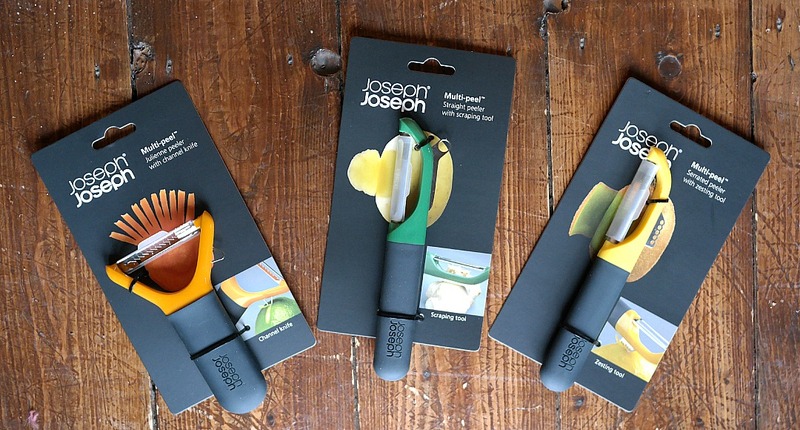 The Multi-peel range (£8 each) and ThermoBaste (£18) are available online from Joseph Joseph and also from John Lewis stores.